Lose The Heat is another fast paced car racing flash game from agame. The police are hot on your trail and so its time to lose them and make them eat your dust. 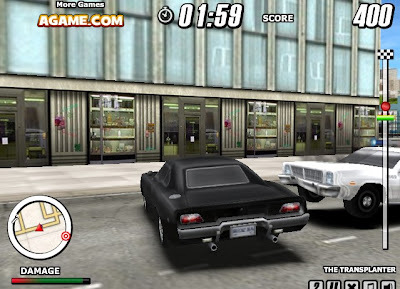 Pick up missions at the local bar and evade cop cars while picking up money on your way. Run through the orange highlighted spot on the road to create obstacles for those chasing you thus giving you room to escape the chase. The meter on the right side of the screens displays your distance from your destination. Meanwhile, if you are looking for some LTH Lose The Heat walkthrough you can see the video below showing how to beat a specific mission in the game.